Silver Spring has undergone rapid change over the last decade, revitalizing its downtown area into a bustling hub of business and entertainment. Despite the rising towers of steel and glass in Silver Spring’s downtown area, much of the area still remains a network of creeks, streams, lakes, and the springs from which the city got its name. All that water adds significant beauty to the landscape of Silver Spring, but compounded with the unpredictable Mid-Atlantic Coast weather, the water can wreak havoc on the foundations of area homes. Foundation repair in Silver Spring requires expertise in the area’s particular foundation problems. The foundation’s primary job is to evenly transfer the weight of your home to the soil beneath. 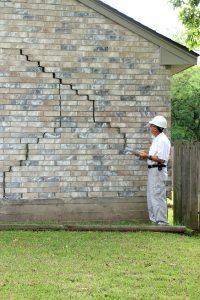 When the foundation begins to move or shift, it can cause structural problems in your home and result in significant damage. The foundation of your home is built on a disparate mixture of soils. How a foundation is built should depend on the specific soil conditions of the build site, but on a basic level, a large hole is dug into the ground, and the soil is compacted. The foundation, which is made of poured concrete in most modern homes, is then built on top of the soil. Under normal circumstances, even a properly built foundation will shift a little bit in the first few years in a process known as settlement. However, significant movement after those first few years can occur when there is an excess of moisture in the soil around the foundation. The different types of soil near your foundation expand and contract at different rates in response to variations in moisture. The movement of the soil can result in a shifting foundation. In an ideal situation, your foundation would not move if it didn’t encounter large fluctuations in moisture level, but that’s not possible in Silver Spring. Unpredictable snow falls and summer storms often lead to overflowing creeks and streams; flash floods seem to be an annual occurrence. How Do You Deal With The Water Problem? If you can’t control the weather in Silver Spring, how do you avoid fluctuations in moisture level around your foundation? Companies specializing in foundation repair in Silver Spring can use a variety of techniques to deal with water problems unique to the area. A relatively easy solution to mild problems is the installation of gutter extensions. Gutter extensions will direct rain water away from your foundation to areas where the rain water can further drain away from the property. Regrading the soil around your property, so that all the land around your home slopes down from your foundation, can also help to drain water away from your foundation. More drastic measures include the installation of interior or exterior drainage systems. This method involves the installation of drainage pipes along the border of your foundation. The drainage pipes collect water around your foundation. An interior system will direct the water to sump, where a sump pump can eject the water out and away from your home. An exterior system will just simply collect the water and route it around the foundation. The downside of these systems is that they can be expensive to install and can involve serious digging and excavation in and around your home. A good company specializing in foundation repair in Silver Spring will be able to perform any and all of these services as needed to address your water problem. An often neglected aspect of foundation repair in Silver Spring is mold remediation. Aside from the structural damage caused by a moving foundation, water in your foundation creates an ideal growing environment for mold. The mold can cause damage to furnishings, dry wall, and even wooden beams. Mold also releases spores and toxins into the air which can cause health problems for you and your family, especially respiratory problems. If you need foundation repair in Silver Spring, it is important to contact a company that can provide mold remediation services to ensure the removal of all organic particles, because even dead mold particles can continue to cause health problems. A reputable service will also be able to recommend waterproofing measures to ensure that the mold does not return.